Minerals are elements necessarily required by the body for different function and good health. As per doctors, 4% of total body mass consists of minerals. They are very important and not created by the body by itself. So, we need them to be consumed as a part of your diet. Most of the minerals are obtained from plants. They are required by the body in a balanced proportion. Excess consumption of minerals can make toxic substances in body. Calcium : Among all the minerals, calcium is the most abundant mineral found in human body. It is the major constituent of bones and teeth as 99% of this mineral is present in bones. It helps in blood clotting, proper functioning of heart, and contraction of muscles and also governs the passage of fluids through the cell walls. Deficiency of calcium can lead to weak bone structure, retarded tooth, and poor Skelton strength. Growing children and ladies requires regular consistent intake of calcium for bone strength. Researches shows that Normal men, women and minerals requires about 800 mg a day. Teenagers, pregnant ladies and new mothers requires 1200 mg of calcium in a day. About 500 mg is enough for infants. All green leafy vegetables, almonds, papaya, broccoli, dates, strawberries, seeds, figs, apricots, sesame seeds, oranges and about all other fruits are major source of calcium. Phosphorus: Like as calcium, most of the phosphorus is found in bones. It is found in the nucleus of each cell in the body. Phosphorus is very important as it is utilized in most cases as compared any other mineral by the body. Major functions of phosphorus involves the digestion or usage of fats, proteins and carbs, works as building element of teeth and bones along with calcium. Deficiency of phosphorus can also make your bones weak leading to weak Skeletal system, mental fatigue, depression etc. Pregnant ladies, new mothers and teenagers requires 1200 mg of phosphorus. For adults and children, 800 mg is required daily. Infants need 400 mg per day. All nuts, all seeds, apple, figs, coconut, peaches, green vegetables, cabbage, beans, avocado, carrot are all good sources of phosphorus. Potassium: This mineral plays part in tissue elasticity, healing up wounds or injuries, functioning of liver and consistent heart rhythm. It also plays vital role in keeping the inter cellular fluid balance and regulates the muscles action. Deficiency of potassium leads to pimple on your skin, liver ailments, slow healing of injuries and poor muscular control. Doctors recommend to consume about 3000 mg potassium in case of adults and 1500 mg for children. All green leafy vegetables, bananas, carrot, almond, sunflower seeds, peaches, papaya, avocado, figs, apricots, tomatoes, all fresh fruits etc. contains good amount of potassium. Sulfur: This mineral in mainly found in nails, hair, blood and cartilage and required in digestion process, bile secretion, toning as well as purification of the system. Deficiency of this mineral may lead to eczema, poor hair and nail growth or may result in inhibition of functioning. There is no particular intake quantity scale for sulfur. All most all foods contains this mineral in adequate amount but Pineapples, cabbage, carrots, strawberries, oranges, apples, avocados, tomatoes, lettuce and cucumber are rich in sulfur. Chlorine: Chlorine in needed inside the body for aiding digestion process. It is also important for the normal functioning of the heart. Deficiency of chlorine can lead to improper digestion and cause pyorrhea. About 500 mg of chlorine in your daily diet is sufficient for a day. Chlorine is found in Coconut, kale, pineapple, mangoes, avocados, strawberries, turnips, celery, tomatoes and watermelon. Sodium: Body utilizes sodium in the formation of digestive juices, carbon dioxide elimination, maintaining the water balance in body and for proper utilization of iron mineral. Deficiency of sodium can cause arthritis, stones in kidney, indigestion and rheumatism. About 500 mg of sodium is enough per day. Sources include Broccoli, melons, carrots, celery, raisins, kale, beets, peaches, cabbage, sunflower seeds, strawberries etc. Fluorine: This minerals contributes in the healing process of the body and is mainly found in skin, teeth, blood, hair, nails and bones. Deficiency of this mineral can lead to weak vision and tooth decay. There is no particular quantity intake for fluorine. Green vegetables, carrots, almonds and about all the plants contains fluorine. Magnesium: This mineral mainly exists in bones, teeth and blood albumen in the body. Body uses magnesium to strengthen the muscles and nerves in the body as well as digestion of carbohydrates. Deficiency of this mineral can lead to disorder in digestion, poor skin complexion, irritation, nervousness, acceleration in heartbeat and poor bone strength. As per doctors, about 70 mg of magnesium is enough for an infant. Children between 2 to 10 years may consume 150 mg to 250 mg per day. All males from 11 years to 18 years can consume 350 to 400 mg per day. All males above 19 should consume 300 mg magnesium however all females should consume 300 mg per day. If you are pregnant or new mother, than you can consume 450 mg a day. Bananas, almonds, cherries, green vegetables, avocados, broccoli, mangoes, raspberries, dates, cherries etc are good source of magnesium. Iron: Iron is the main constituent of hemoglobin in the blood and represents the blood quality in a particular body. It is used by the body to in building up bones, muscles, brain and its major function involves carrying oxygen to all the body parts. Lack of iron leads to anemia of the skin and may lead to pale complexion. Children from 1 year to 3 years old can consume 15 mg of iron and children between 4 to 10 years should consume 10 mg iron. For males between 11 – 18 years, quantity should be 18 mg per day and 10 mg for all males above 18 years. Females from 11 to 50 years needs 18 mg of iron a day and for females over 50, consumption should be 10 mg per day. 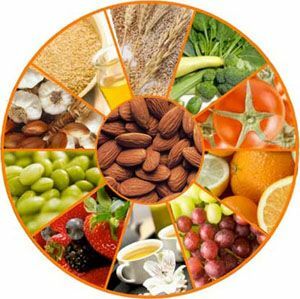 Main source of iron includes Green leafy vegetables, sesame seeds, broccoli, almonds, cherries, almonds, walnuts, apricots, figs, lettuce etc. Manganese: Manganese is basically used by the body in carbohydrates metabolism, strengthening bones and formation of thyroxine in the body. It is mainly found in lungs, pancreas, liver, brain, bones, prostrate glands and kidneys. An adult body needs body requires 15 to 25 mg of manganese whereas 2 to 15 mg in case of children. It is basically found in green leafy vegetables, nuts, cucumber, beets, banana, squash, carrots etc. Silicon: This mineral is present in skin, nerves, muscles, hair, connective tissues, teeth, blood and nails but pancreas contains most of the silicon. Deficiency of this mineral can lead you to baldness, skin problems like rashes, skin irritation, may cause tooth decay, can affect your vision as well. Sources of silicon includes carrots, tomatoes, cucumber, apples, figs, bananas, grapes, cherries, sunflower seeds, beets, cabbage, watermelon etc. As per doctors, most of the silicon is present in the outer layer or skin of fruits as well as vegetables. Copper: Main function of this mineral is to help in absorption as well as digestion of iron mineral and copper is present in lungs, heart and liver in the body. Copper is present in sesame seeds, raisins, vegetables, nuts and sunflower seeds. Iodine: Iodine is required by the body for the production of thyroxin which regulates the body metabolic function. It is found in the thyroid gland in the body. It helps in regulating the circulatory functions of the body as well as in the oxidation of proteins and fats. Deficiency of iodine can lead to improper brain functioning, development of goiter and may lead to nervous disorder. This mineral is required in very small quantity on daily basis. Sea vegetables are biggest source of Iodine. We can get iodine from Kale, peaches, strawberries, cucumbers, pineapples, tomatoes, grapes, carrots etc. Zinc: It is present in liver, brain, thyroid, kidney as well as reproductive organs in human body. Zinc is required by body for healing purpose, production of insulin, regulating the blood sugar level and to transfer carbon dioxide to lungs from the tissues. Deficiency of Zinc may lead to prostrate problems, depression, malfunctioning of intestine or improper body growth. An infant about 5 months old needs 3 mg of zinc daily whereas 1 year old needs about 5 mg. Children up to 10 years old requires 10 mg daily. In case of adults, 15 mg is required. Pregnant women or new mothers needs 20 to 25 mg zinc per day. You can get zinc from nuts, seeds, green leafy vegetables, sprouted wheat and yellow vegetables.